To pay for a luncheon, click on "Events" and enter $28. You can use a PayPal account OR pay with a credit card. 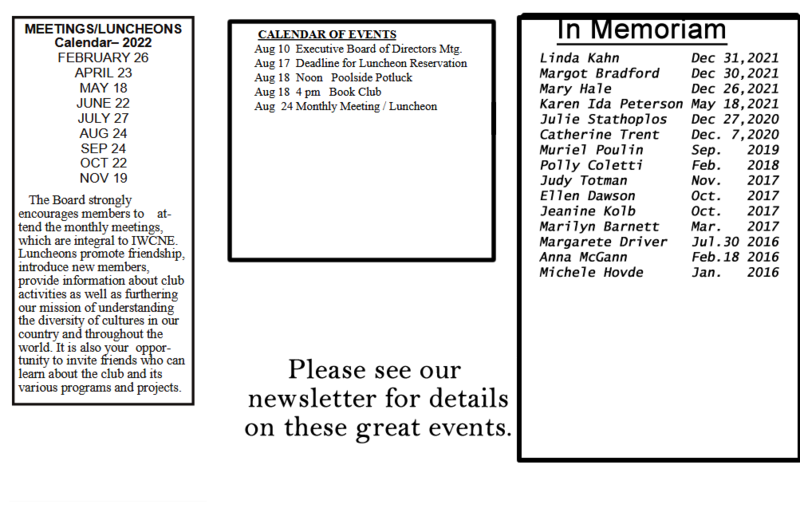 The IWCNE conducts several types of fundraising activities. Three charities are identified as recipients each year, and the funds are presented at the January meeting. Some of the activities occur monthly and provide varying amounts of monies, plus at least one major fund-raising activity is conducted each year in the Spring. Raffle tickets are sold at each luncheon meeting, and a drawing is held for door prizes that have been donated by members. Monthly potluck meals provide another contribution to our funds for charities. Additional fundraising activities have included a popular Fashion Show during the late Spring with members modeling the clothing. Annual Holiday Fair-- IWCNE has helda Holiday Fair each year since the club was founded, and it is a major fundraiser for our charities. A variety of craftspeople are invited to rent space from us to offer their creations. Members of the club also make Christmas decorations and baked goods to sell, as well as raffle tickets for valuable gifts and a luncheon that is served throughout most of the day. In addition to raising money for our charities, the Fair is a good opportunity for the club to be well known in the community. Every year we welcome back long time vendors and shoppers, as well as meeting new ones. Monthly Potlucks The pot-luck meals are a fundraiser not just for our members, but spouses, significant others as well. We try to have one monthly at various gracious homes and many times they are holiday themed The hostess can choose a theme and/or time of day so that we end up with not only suppers, but brunches, lunches, teas, etc. as well. Often we dress up in our Spanish, Mexican, German, Irish, French, etc. costumes. The St. Patrick's Day event even includes delightful Irish music. The cost is $10.00 and each person brings an appetizer, main course or dessert so that the hostess does not have to provide too much more than her house. They are great events and everyone always enjoys fabulous food and company.